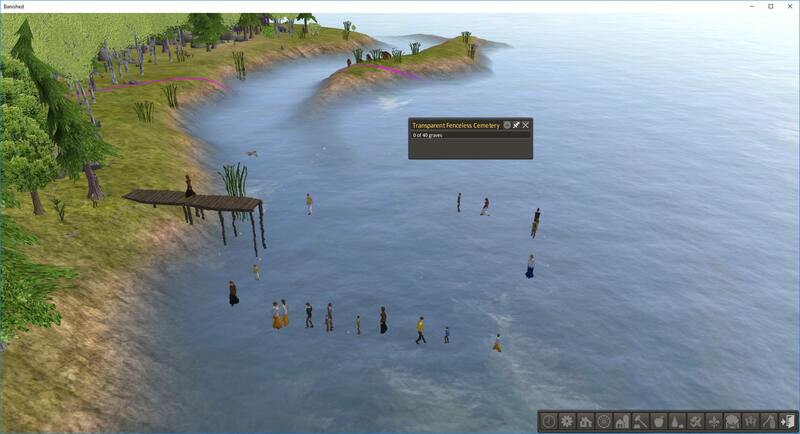 For a true Dock Life experience, we could add a Burial at Sea option to replace a land cemetery. It would be a building, when a person dies, it immediately registers in the building as a single death (like the the cemetery) but no tombstone needed. It is understood that the dead person has been buried 'at Sea', so to speak. It will give the same comfort as a land cemetery. The list can auto update like the cemeteries, so that names stay on for maybe 5 years or so, then leave and give room for more to be added. You could have a small building for say, up to 20 names, a med building for more and a large, and so on. You could have maybe a small park-like setting in front, maybe some benches and a small stature or fountain, that can be used for idling, if you want them to idle there. And it could be made standalone, and or added to the CCDocks mod for those like me who find CC a bit too much for my old grandpa laptop, lol. Thank you for reading. EDIT: Oh, and my daughter suggested if possible, that when a person dies, they also launch a canoe on fire and send it upstream, for a Viking type funeral. That is IF the animation is possible. It could be a choose option as well, to have that or not. This is really the best recommendation I've read in a long time. Love the canoe on fire! Too bad it can't be done. The canoe on fire can't be done? Or the Burial Dock? but you cannot associate this to a citizen death. and also the canoe wont be able to move.... only a pure decoration item. Ok, but the canoe on fire was my daughter's suggestion. Let's forget that idea now. It wasn't my original idea of a dock burial building. How about that? the cemetary cannot be changed much cause the hidden mechanics secretly linked to it . you can change the look of the tombstones, you can change the look of the fences all around but you cannot add another ground, i mean a floor. 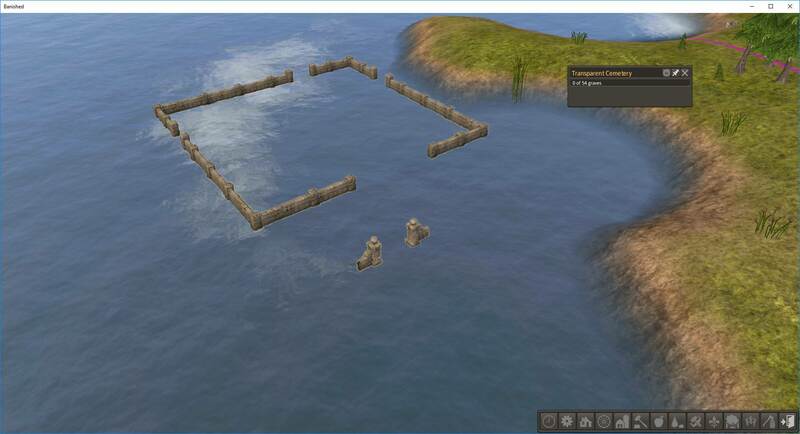 you can change the texture on the ground, but you cannot add the floor itself, so the tombs would stand floating on the water. and you need to keep the way it is done, you cannot decide it is a crypt like, or a dock, or a building. you click and drag and it put fences all around and the game makes appear tombstone randomly inside. i know when we are not a banished modder it can be difficult to know what we can do... what is a building/resources... and what is a game mechanic. i hope the explanations of each part help you to understand what can be done. Ok, then, was just an idea. Hope my other idea, the Dock Veggie Patch, gets better response. Would an invisible graveyard with invisible fences and invisible tombstones that can be built on water work? Probably. Although I guarantee that someone will build one and then forget about it and then come here and complain that they suddenly can't build in a certain spot (because there's a graveyard in the way). People walk through graveyard while idling, right? So we'd get people either walking under lakes or magically walking on water? That's a good point. I don't actually know what would happen. They walk under the water to go build things, but then can't walk under the water to get back. I don't know if they will go under to idle at the water cemetery. Well, I figured out what it would do. 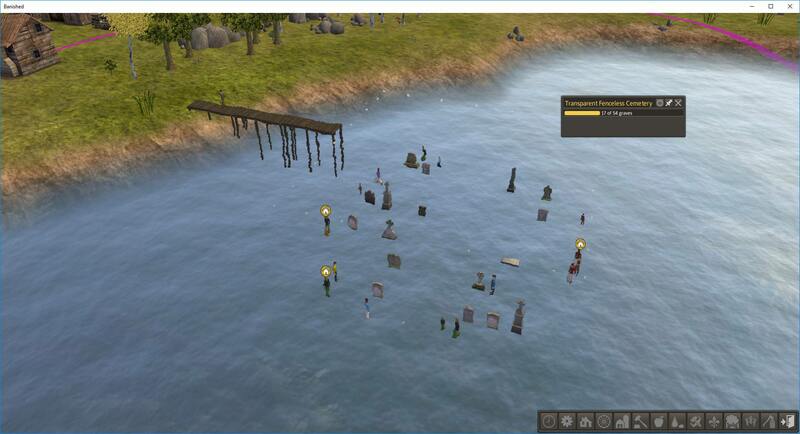 When you give them the dock to get there, they go and walk under the water around the cemetery. If you remove the dock, they turn homeless because they can't get back. But they're more than happy to chill under the water and idle. Bwaha! That's both awesome and terrible! Love it! I would probably add a bonfire and some torches from Red Ketchup's I See Fire mod on the shore. whats about the tombs ? do they float ? or they are on the sea floor ? They sit on the sea floor with the people. Could probably make new models so they're raised or something? Or invisible tombstones. Or make a "floor" so that they can walk on the water maybe. Oh, even more interesting. If you do with a fenced cemetery, the fence will be at 0 level, but the gate is on the sea floor.